'Athe karanathal', is a Short Fiction by Jeevaj Raveendran and produced by Ramshina Kv. ‘Athe karanathal’ is a short fiction which delivers a strong message that our women are not safe even at their homes. The Short film is from the independent film production house Hole media. 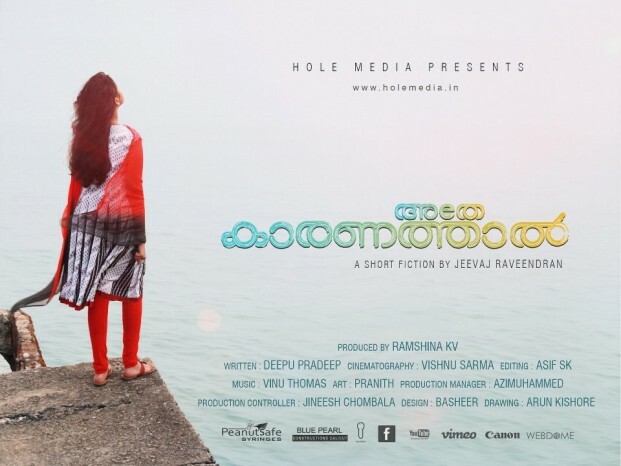 The story of ‘Athe Karanathal’ is set in the beautiful Malabar region of Thalassery and the film is shot at the Thalassery sea bridge (Kadalpalam ). ‘Athe karanathal’ is directed by Jeevaj Raveendran and actors in the film include Vinod Kovoor (Marimayam) and Sadhika (Patttusari serial fame).The camera is handled by Cinematographer Vishnu Sarma.